Still playing with PartyGirl and Party Time. Originally I'd made a one layer card with the dress but I didn't like the monochromatic background I'd made, so I cut the dress out and made a new colourful background. I've used the Distressed Damask Background and Distress Inks (Fossilised Amber, Pickled Raspberry and Festive Berries), spritzed with water and stamped. This is the second impression, the first one is much bolder. 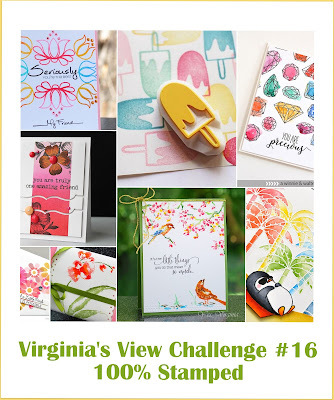 Take a look at more inspiration from the rest of the STAMPlorations design team, and if you want to CASE any of the cards, link yours up to the challenge for a chance to win prizes. I'm entering this into Virginia's View - 100% Stamped (my second entry). I'm quite sure that the first version was just as lovely as this one! 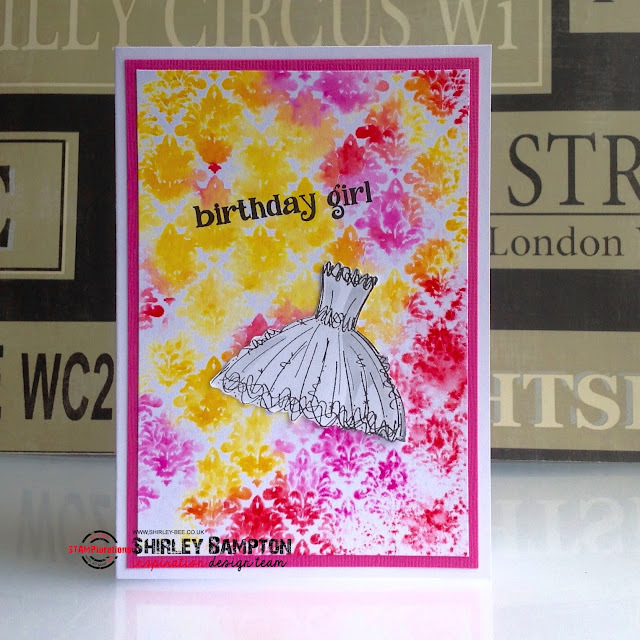 But I must say that this background is fabulously festive - the perfect background for the sweet party dress! A wonderful mix of colors - beautiful!! Echoing the others: an amazing background that showcases the dress fabulously! Stylish!